The Moseley Railway Trust is proud to announce its twinning agreement with the Frankfurt Feldbahn museum, Germany. The agreement was marked by a visit to the Moseley Railway Trust’s Apedale site by two representatives of the Frankfurt Museum, Ruediger Fach and Stefan Kaiser. The visit took place during the opening weekend for the Moseley Railway Trust’s new Apedale Valley Light Railway (September 18 2010). Herr Fach made a speech in which he stressed the significant common ground between the Moseley Railway Trust and Frankfurt Feldbahn Museum. 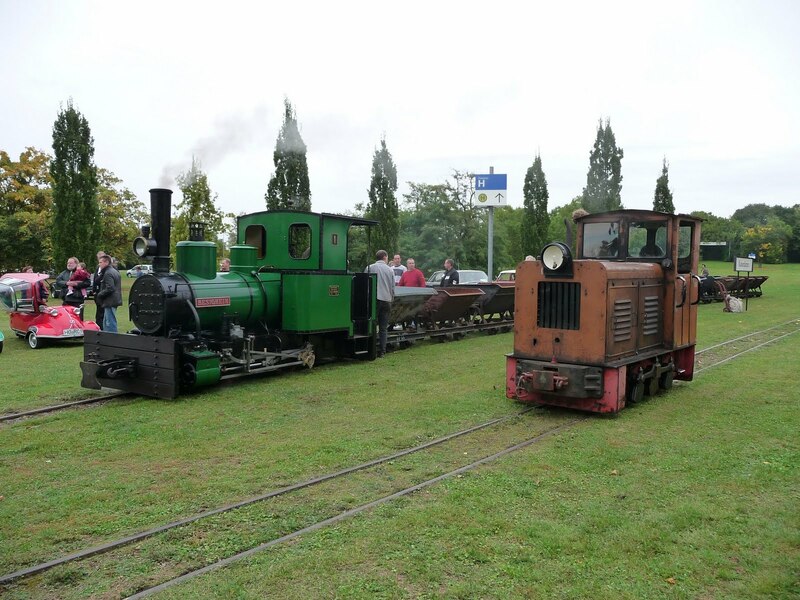 He said “We share not only the same narrow gauge of 2 feet or 600mm but also our love of the smallest “real” regular steam locomotives and especially military light railways”. Herr Fach went on to observe that England is regarded as a model for the preservation of industrial heritage. Phil Robinson, Chairman of the Moseley Railway Trust, presented Herr Fach and Herr Kaiser with a plaque marking the twinning agreement. The Frankfurt Feldbahn Museum has been in operation since 1975. It has an extensive collection of narrow gauge steam and diesel locomotives, and is regarded as one of the premier narrow gauge railway centres in Germany. It operates on a site close to the centre of Frankfurt. The railway is 600mm gauge, and runs into the nearby Rebstock park. The Moseley Railway Trust also operates a 2’0” gauge (approx. 600mm) railway, and also operates in a park – in this case the Apedale Community Country Park. It is planned that the twinning agreement will lead to exchange visits between members of the two organisations, together with interchange of technical and historical knowledge.